I couldn't sleep (nothing new), and decided to see what was on TV, it's 4:30a.m. and since I have sworn off infomercomercials I was scrolling through the billions of channels and get to MSNBC and not only did the title of the program make me giggle, I grabbed my computer: Way Too Early With Willie (Geist). WHO thought that was a good idea???? I have lived my life with an odd name and I'm not suggesting Willie is an odd name, but when you put it with Way Too Early With... then YES it's ODD! Then on top of that it's a serious news program, I can not take that serious! I switched to HSN, I consider that "research" I'd love to be a home shopping host. I bet that is so much harder than anyone thinks, I'm going to start practing with my jewelry in the mirror and see if I can talk ten minutes straight about a pair of gold hoop earrings and ask my friends to "call in." I've been looking for a job. That could be it. No one would giggle at "Way Too Early With Tikaa" they wouldn't take me serious either. Again, I mention it's early, so I'm now switching gears to what I originally planned to post about, a friends birthday lunch yesterday. The above picture is a few things I got together to help give her a nice lunch. 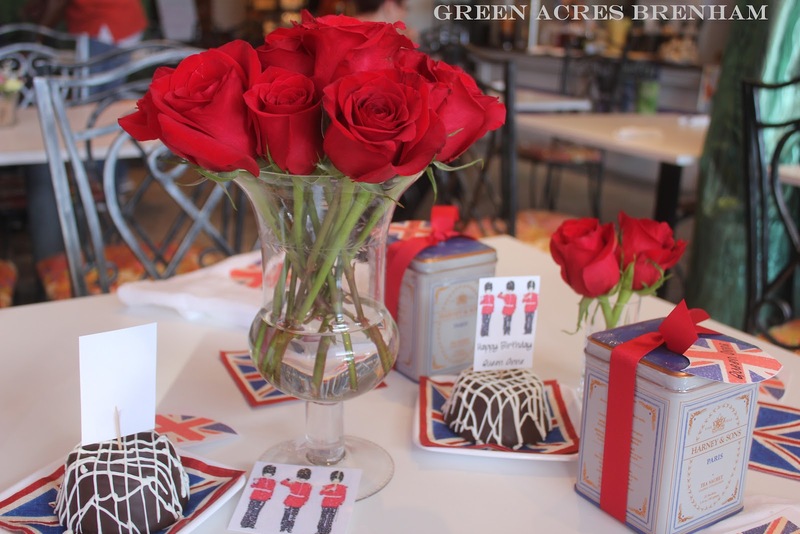 Everyone should feel special at least one day a year, so why not on your Birthday. 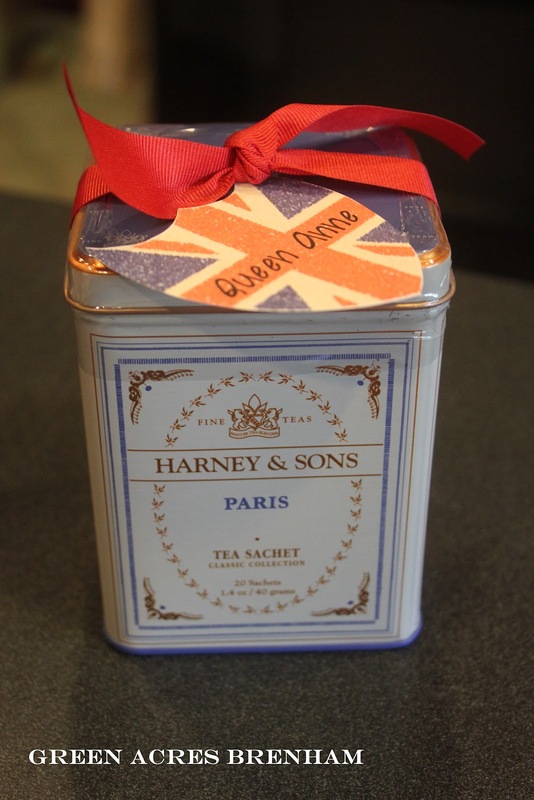 The Party Favors - Harney and Sons tea. Grosgrain ribbon and union jack crest with birthday girl's name. I put each guest name in the crest. 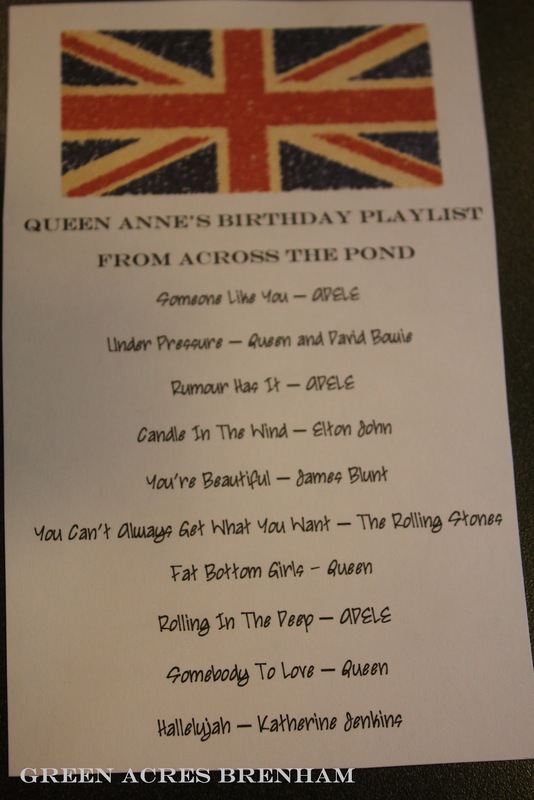 To add a little fun and interest to the lunch, I made a playlist (Queen Anne's playlist from across the pond) on my ipod. 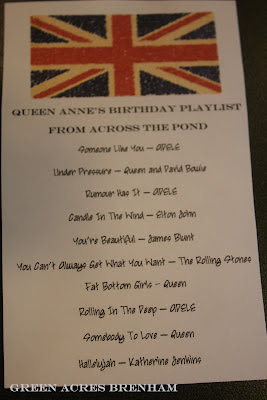 All the songs were from artist from across the pond. I then asked the cafe we ate lunch at if they would play my ipod in there system (I showed them the playlist, and they loved it and, the worse they could say was no) they were over the top willing to play it. Our little table, with the fun birthday accents. 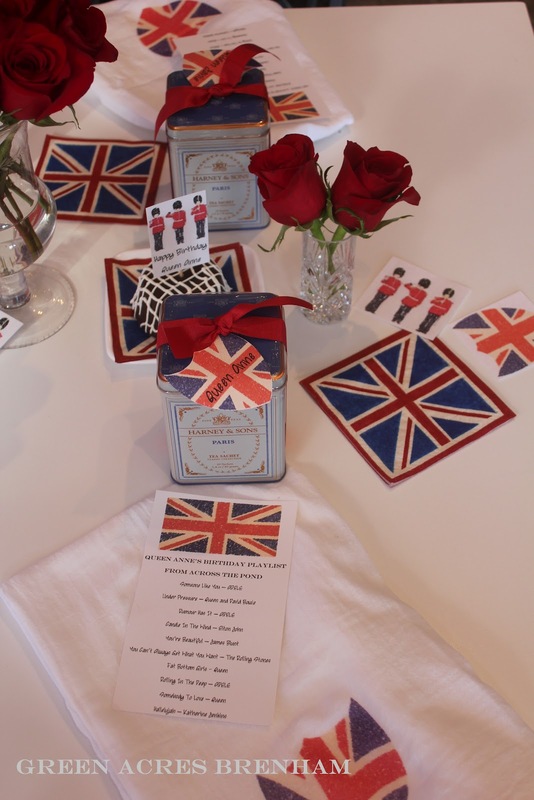 I made the flour sack towels (which we used as napkins and gave to Queen Anne after) by ironing on the clip art. I've done a post about it before (you can do a quick search on my blog and find it, super easy). Arranging the flowers (if you call it that) and getting them to the Cafe was a tiny challenge but looked pretty with everything and the birthday girl got to take them home to enjoy for a next few days. Oops, more water was added to the flowers before the birthday girl got there, but I guess not before I took the picture. It's easier to travel with less water in the container. 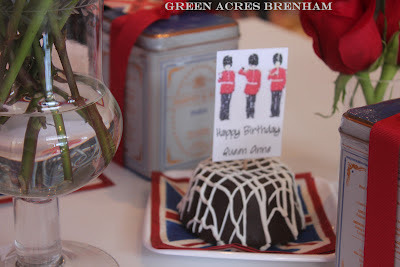 Queen Anne (birthday girl) likes chocolate, I made the little Royal Guard toppers for the dessert, more birthday fun! 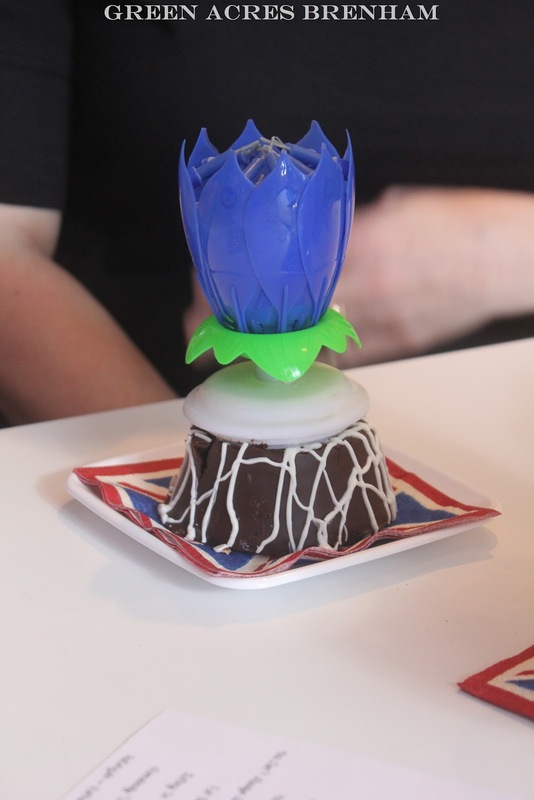 Closer look at the precious desserts. 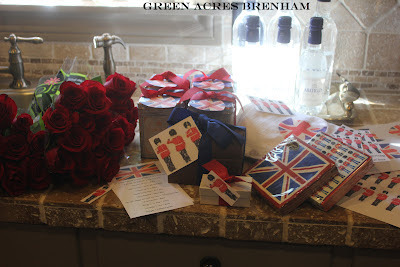 Of course we opened presents at which point Anne's mom said, "I gave you the gift of life." She did actually give her that gift, but others too. It made me laugh (it's still making me laugh). Later Anne said, "My mother is like Joan Rivers without the plastic surgery." They are adorable. Another friend brought the desserts, and this super, super, super fun birthday candle. Everyone in the cafe was Ooooohhhhing and Aaaaaaahhhhhhing over it. It was FUN!!!!!!! 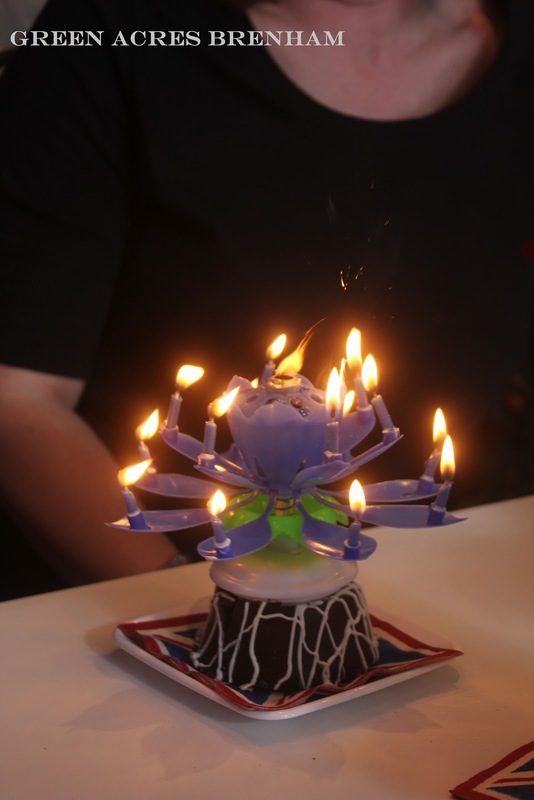 Once you light it, the above picture happens and I had no idea what to expect so the flame caught me off guard and for a second I thought it was malfunctioning, The flame was high! It looked like we were about to roast smores. Then the flower POPPED open and fourteen candle petals started spinning around while "Happy Birthday" was playing from the center. It was pretty darn cute!!!!! I thought any second it could have sky rocketed off the plate. On another early morning side note, if I tell you I can NOT do something because I am just toooooooooooooooooooooo busy, that actually means that I would rather sort socks or count pennies...get the picture. We all know you find time for the things you want to do. We are all busy, thank goodness to, how boring would life be otherwise. 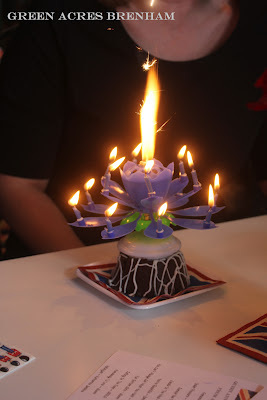 It was the most wonderful birthday, Tikaa! You're the best. Certainly the "Hostess with the Mostest". I so enjoyed the party. You are the best kind of friend a girl should have. What a beautiful table!!!! Loved everything - so creative. What a way to celebrate a special day. JoAnn - your biggest fan in SC. 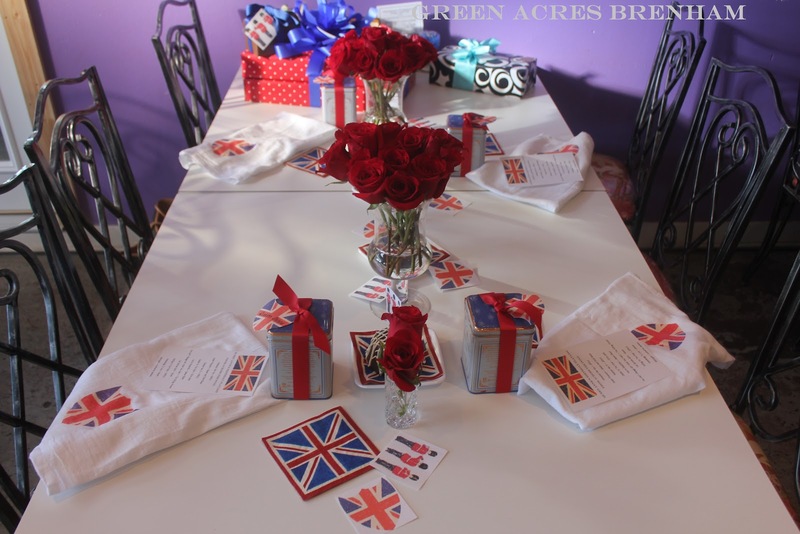 what a precious bday party idea?! You're a precious friend to have done all that....looked tooo cute!! 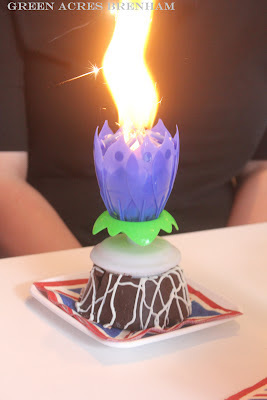 And the candle is wild....I'll have to hunt for one of those.